For Keith, shooting portraits involves not only capturing all those memorable moments, but also doing it in a purposeful way ... seeing the shot happening, visualizing the photo in the mind, and knowing how to get that image with the equipment in your hands. Existing light photography is often viewed as the best there can be outside of shooting in our studio with professional lights. The ability to capture dramatic images in all types of situations and light depends on being able to first find the light, determine how best to use it, have the right equipment to shoot with, know how to use the camera and finally, the ability to edit the photos to perfection before sending them off to the lab to be printed. 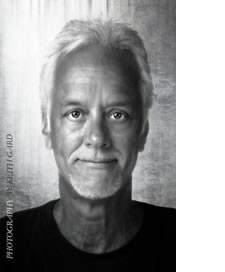 Coming from a background in the graphic arts and the internet, Keith has been involved in photography for over thirty years and with digital photography for the last fifteen years. He has been photographing seniors at St. Teresa's Academy, Rockhurst and Notre Dame de Sion for over 11 years. Keith has been photographing drama productions at STA, Rockhurst and Sion for over 12 years, and was the exclusive photographer for Kansas City Ballet's production of "The Nutcracker" for 5 years. His event photography is regularly published in "The Independent" magazine. He is also involved in documentary and commissioned artistic photography. Currently he has expanded his work to video production. Jim's specialties include: Commercial, portrait, fashion, glamor, wedding, scenic, and industrial photography. His experience with lighting is unsurpassed! He has over thirty years as a photographer creating commercial images for print, multi-media, and video production. Jim has created & published a multi-media digital photography curriculum for high schools, recruiting and collaborating with Canon USA, professional photographers, Adobe, yearbook teachers, and professors. He is an innovative Visual-Media Photographer with a proven track record of directing multiple projects and also an energetic leader with an ability to maximize the effectiveness of cross-functional teams to develop cost-effective, results-oriented marketing solutions. Jim consistently maintains outstanding customer and vendor relationships through ongoing customer-focused needs analysis to continually improve customer engagement. Jim has an extensive background in Visual Media productions, Photo/Video Editing, IT infrastructure, UNIX, Windows, MacOS X, digital meta-data management, and color reproduction in both additive and subtractive media. Has experience in large scale production of catalogs with workflow of parts in excess of 700 parts. He has advised as a lighting expert on large scale productions and complicated conditions for customers across the USA. With a passion for excellance and the energy to keep projects on task, he is an absolute joy to work with.